Apple Strudel – Caramelised apple strudel, perfectly blended with vanilla custard finished with a sprinkle of cinnamon. Maple Syrup – Sweet maple syrup infused with vanilla custard leaving a deliciously syrupy taste. Purple – A crazy mix of grape, bubblegum and custard, creating an unbelievable all day vape. Raspberry Jam – Lush Raspberry jam merged with a creamy custard, scrumptiously sweet & sugary goodness. 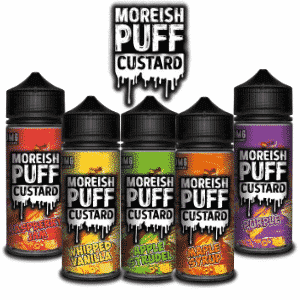 Whipped Vanilla – Classic vanilla custard whipped to perfection to form a fresh milky vape full of flavour.